Have you been through phases where you were ready to try anything to get rid of the stubborn acne? If yes, then we tell you about a peculiar method that has provided effective results against acne for many women. Peculiar why? Because it does not need you to consume any medication or apply anything topically. What is required is that you do oil pulling every morning. 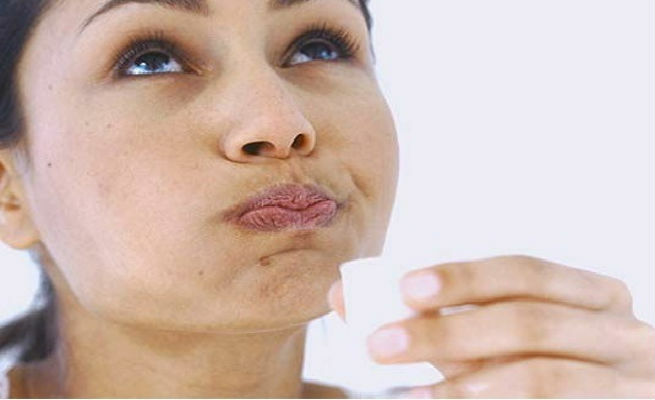 We tell you here what oil pulling is and if there is a link between oil pulling and acne. Oil pulling is the method of swishing and swirling some sesame oil or coconut oil in your mouth every morning for a good 20 minutes. It is an ancient remedy for people wanting to get rid of bacteria from their body. What actually started as a remedy for strengthening the teeth and ridding the mouth of unwanted bacteria is now touted as a way of preventing acne. As soon as you wake up, wash your mouth with some water and use a floss to remove any plaque deposits between your teeth. Next, take a tablespoon or two of coconut or sesame oil and swish it around in your mouth. You will have to do this for a good twenty minutes, working your cheeks and lips. Do not overdo it to the extent that your jaw hurts. Once you are done swishing, spit out the oil. Rinse your mouth and brush your teeth as usual. The anti-bacterial action of the oil kills decay causing bacteria in the teeth. It rids you of any kind of toxins in the mouth. Since the digestive tract is linked to the mouth, you are preventing toxins from entering your system. Since it works on removing deposits from the teeth and killing harmful bacteria, it has been effective in healing tooth sensitivity and gum problems. It also gives you whiter teeth. Oil pulling almost becomes a ritual when you practice it regularly. The oil tastes very bad in the mouth after all the swishing and makes one more conscious about the kind of food one is putting into the mouth through the day. While there is no evidence linking oil pulling and acne treatment, there are many women who swear by its effectiveness. Many women practicing oil pulling have claimed that it has lead to a clearer complexion and fewer zits on the face. This side effect of oil pulling may to attributed to eating the right kind of foods though, and not directly to the oil pulling ritual itself. It does have its advantages in the sense that it removes harmful bacteria and toxins from the body before it can enter your digestive tract. However, there is nothing stopping you from trying this remedy since it does not harm to the body. It has worked for a few women and may work for you too! If not acne, we can at least promise you that it will curb the sensitivity in your teeth and give you a fresher breath for sure!